Paul is the only visual presence in the movie and turns in a gripping performance as a civilian caught in the war. Swinging from a defiant belligerence to medicated sobriety to despondent realism, Paul is realistic and relateable. All other characters in the movies are voices on the phone, and range from the bored 411 operators, the bitchy ex-girlfriend, the inconsolable wife and the matter-of-fact negotiator. All bring in a level of twisted hilarity to the situation that would make one laugh out were it not for its hopelessness. The movie definitely suffers from its own plot impossibilities - like having a lighter lit for a couple of hours inside a wooden coffin. (High school science tells us it will probably be not more than a few minutes before all the oxygen in the coffin is used up) Or having microwave radiation (cell phone signal) penetrate earth to give you enough bandwidth to upload a video in under 5 seconds. But fortunately, after the first few minutes of disbelief the story quickly takes hold of you. Given that the ending of the movie caused some in the theater to swear loudly was ample evidence that physical improbability was not on the top of anyone's minds. 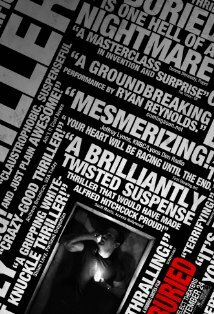 All in all, it is a brilliant thriller that grabs hold of you from the first scene till the last. Even with its sparse set of elements, the movie is great way to spend a couple of spellbinding hours.